A Masters of Science is offered as part of the Residency Program, and graduate studies can be incorporated into the program of exceptional students who qualify for admission to the Graduate School. The objective of the program is to prepare the individual for working in the fields of epidemiology and herd health. A thesis is required of prospective students. 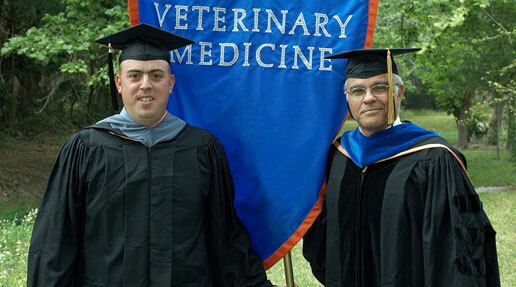 The applicant will follow the guidelines of the Graduate School -College of Veterinary Medicine major in Veterinary Medicine with an optional minor in Statistics. Eligibility for enrollment in the graduate school. Sufficient motivation and ability to pursue both programs. 12 credits minimum (includes Animal Science, Dairy Science and Epidemiology courses). Statistics minor– 8 credits minimum (optional). DAS 5212C Dairy Management Systems * 4 credits. Quantitative approach to management decisions and evaluation of performance. Record and information systems, modeling and simulation. DAS 6281 Dairy Science Research Techniques 3 credits. Methods employed in research in specialized dairy fields;genetics,nutrition and physiology. VES 6765 Microcomputers in Veterinary Research 2 credits. Operating systems, word processing, spreadsheets, data base managers, communications and other application as used in veterinary research. STA 6934 Introduction Epidemiology3 credits. Basic principles and methods of epidemiology using relevant examples from the clinical and public health literature. Various study designs as well as issues to be considered in analysis and interpretation epidemiologic studies. STA 6166 Statistical Methods in Research4 credits. Statistical inference based on t, F and X 2, tests. Analysis of variance for basic experimental designs. Factorial experiments. Regression analysis and covariance analysis. STA 6200 Fundamentals of Research Design2 credits. Choosing the research objective, determining the type of data to collect, choosing the sample and randomization technique applications to biomedical data. STA 6201 Analysis if Research Data3 credits. Introduction to the most commonly used statistical analyses, with application to the biomedical sciences. Emphasis on choosing the appropriate procedure and evaluating the results properly, rather than on the computational aspects. STA 5106 Computer Programs in Statistical Analysis1 credit. Utilization of SAS® for analysis of balanced experimental data and regression analysis. STA 6706 Applied Multivariate Methods 3 credits. Bivariate relationship: Matrix algebra, review of multiple regression and correlation; part and partial correlation; canonical correlation; discriminant analysis and classification; cluster analysis; factor analysis. STA 6176 Introduction to Biostatistics3 credits. Definitions, terminology and research design concepts, basic demographic concepts, measures of morbidity and mortality, analysis or epidemiological studies and clincial trials, introduction to survival analysis. STA 6167 Statistical Methods in Research II4 credits. Analysis of split plot and nested designs with incomplete blocks, confounding and fractional replications. Analysis of/count data. Nonparametric methods. STA 6177 Advanced Topics in Biostatistics 3 credits. Analysis of biological assays, logit and probit analysis, nonlinear regression, survivorship analysis and competing risks analysis, advanced methods for clinical trials. A graduate committee of at least three members will be selected with at least one member from the Food Animal Service and one member outside of the College of Veterinary Medicine (for example the Department of Statistics if doing a statistics minor). This follows the guidelines set by the Graduate School. Allocation of time for study and research: Graduate students will have either every Tuesday/Thursday of Monday/Wednesday/Friday off each semester for attending classes and doing research. Time allocation will be determined each semester, but no more than 8 credits may be enrolled for per semester.